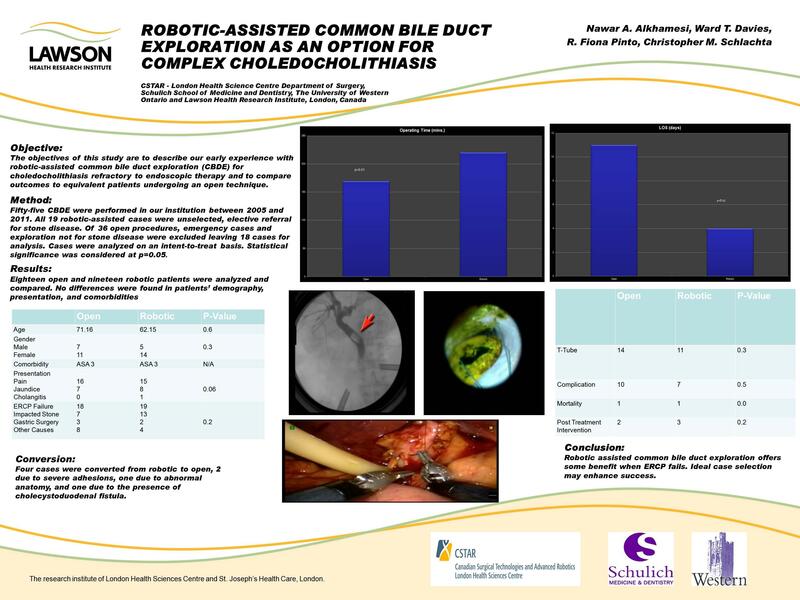 The objectives of this study are to describe our early experience with robotic-assisted common bile duct exploration (CBDE) for choledocholithiasis refractory to endoscopic therapy and to compare outcomes to equivalent patients undergoing an open technique. Fifty-five CBDE were performed in our institution between 2005 and 2011. All 19 robotic-assisted cases were unselected, elective referral for stone disease. Of 36 open procedures, emergency cases and exploration not for stone disease were excluded leaving 18 cases for analysis. Cases were analyzed on an intent-to-treat basis. Statistical significance was considered at p=0.05. There were no differences in patients’ demography, comorbidity, or presenting symptoms. Reasons for endoscopic failure in both groups were similar. Comparing robotic-assisted to open surgery, mean operating time was longer 220+/-41.26 vs. 169+/-65.81 min. (p=0.01); however, median length of stay was shorter 4 vs. 11 days (p=0.02). There were 4 conversions to open surgery (21%) due to severe adhesions. No statistical difference in T-Tube usage between the groups (74% vs. 61%, x2=0.667, p=0.414). There were 2 deaths in the open group and one in the robotic cohort. Postoperative complications occurred in 10 open vs. 7 robotic cases (x2=0.703, p=0.402), they were mainly cardiac and wound related in the open group and respiratory among robotic-assisted cases. Of the converted cases, 2 had similar complications to the open group. Postoperative ERCP for retained stones was performed in one open and 3 robotic case. Robotic assisted common bile duct exploration offers some benefit when ERCP fails. Ideal case selection may enhance success.